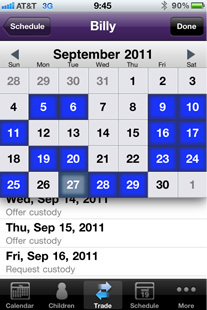 Custody Connection, the first of its kind, syncable cloud based custody calendar iPhone App! 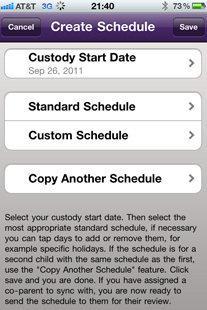 What makes Custody Connection unlike any other app is its unique, optional sync feature which allows co-parents to connect (sync) and maintain an accurate, shared custody calendar. 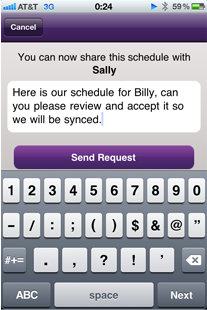 No need to send a text, email, or make a phone call; this option allows co-parents to easily communicate and request changes at the push of a button. Your changes are automatically updated so that you, your co-parent and your children are always up-to-date--Taking the guess work out of who has the children and when, will truly make life easier! It's all about "Keeping Parents and Children Connected"
Acts as your primary calendar with your custody schedule programmed into it, allowing you to add your daily events while always seeing custody days. Customize the look and feel by selecting different colors for each child. 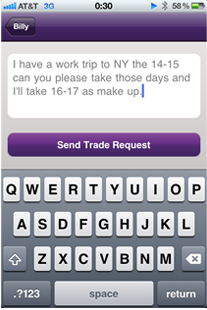 Custody Connection automatically adjusts for the Trade Request and updates both calendars so you are never in dispute as to straying from your agreed upon custody agreement/percentage. One central location for your child's information. School contact info, doctor's and dentists info as well as important insurance phone numbers. 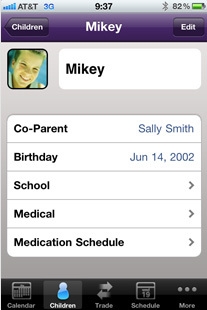 The dynamic medication schedule will help remind you of your child's medication, what, when and how much to give. Don't forget to add your favorite picture of your child! Create and manage your custom schedule easily within a few seconds or use the built in library of standardized custody schedules. Add holidays and any specific dates, tap - save, that's it you're done! This app is so easy to use and has made my life SO much easier! My ex and I are finally on the same page, I'm hooked! My son told me about this app and it has really made planning visits easy. I just look at the updated calendar and know exactly when he has his kids. I find the holiday schedule especially useful. Great app for grandparents! Wow, this app has made my life so much easier! I am in the Army and between work and activities for 3 kids, this app is a life saver. 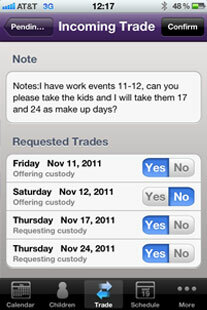 The trade day feature is awesome, my ex-wife and I have not had a single issue with custody days since using the app. 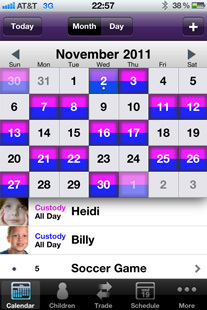 Oh and the holiday schedule and custom colors for the kids are really convenient features. Thanks CC! I have specialized in family law for more than 10 years. Confusion and conflict regarding parenting time schedules are very common problems for my clients. Custody Connection greatly reduces that conflict, saving parents thousands of dollars in legal fees. I highly recommend Custody Connection. SalesXelerator is an innovate company that creates and develops mobile applications as well as offers a host of marketing related services. 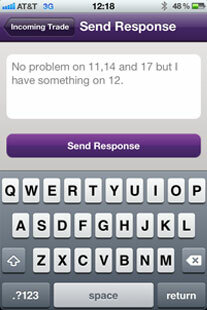 We are dedicated to offering exceptional customer support and will respond to any request within 24 hours! Scott has been in the mobile technology industry for nearly 15 years and has held management and executive positions with several Fortune 500 companies resulting in being named a top executive by CRN.com and Everything Channel Magazine. The concept and design of Custody Connection is a direct result of Scott's experiences as a parent with shared custody. Copyright ©2011 SalesXelerator, LLC. All rights reserved.